Two Zebrafish on a date. You are probably not among those who subscribe to the newsletter of the "Leibniz-Institute for Freshwater Ecology and Inland Fisheries" (IGB) - but you probably should. Their recent press-release (in german) is a real eye-opener - it has potential to completely change my bar-life. 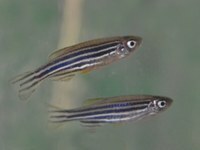 Scientists at IGB devised an experiment code-named wedding-planner in which they check which male Zebrafish get's lucky on a date. The result is nothing short of stunning. If the girl-fish gets to chose between a number of differently attractive guys she does not go for the most attractive stud but the second-best looking. Reproducibly. The reason is, they found in a monogamous setup, that the super-guy tends to bully the female zebralette into submission, which kind of spoils the party. Quite reminiscent of what we observe amongst humanoids. Too bad that neither Zebrafish nor those brawny bar-peacocks have enough brains to read and understand the study. I knew this, so do many other women. You will have to find a bar with extremely - beyond the norm good looking men...lol. Yep, Angelina the fish, women also know that! Academics should be blogging? No.